Trine 3: The Artifacts of Power has not gone over particularly well with fans of the series. Criticism of the game's length—it's apparently quite short—and cliffhanger ending were persistent enough that the studio issued a response earlier this week saying, basically, that its ambition exceeded its financial capability. Today, Frozenbyte's Kai Tuovinen and Joel Kinnunen went a step further with a video apologizing for its shortcomings as well as their ineffective marketing efforts, and said that the next step will be "do or die" for the studio. What that next step will be—paid DLC, a standalone sequel, or even some kind of freebie—still hasn't been settled on, something that Tuovinen believes is a big reasons for the negative reaction to the game: because the studio wasn't certain about how it was going to finish the story, it simply said nothing about it at all. "We decided to stick with it and just see how it goes, because the sequel would heavily depend on the reception and how well the first part would do financially. So we didn't want to make any promises that we might not be able to keep in the future," he says. "Basically, we took the easy route and didn't say anything, and instead of rewriting the story completely so it would fit, like, five levels of a shorter game, we decided to stick with the original story that would then span over to other games in the future." Frozenbyte has been around for 15 years, according to Kinnunen, much of it spent on the first two Trine games, which were financially vital but apparently left the studio feeling like it was in a bit of a rut. "We really wanted to do something new, and we really wanted to do something new with the Trine series," he says. 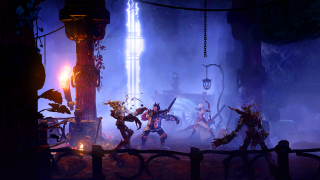 "We do have some other projects going on, but they still don't sort of satisfy the hunger we had for a new Trine game that was really cool and different. So we went with the 3D, and, yeah, that may not have been as smooth as we had hoped." "We're still figuring out our future plans in this aftermath," Tuovinen says at the end of the video. "But it looks like it's pretty much do or die for us at this point. Back to the drawing board, completely." It's kind of hard to watch, because both Tuovinen and Kinnunen look incredibly downcast throughout. There's also a rather surreal bit starting at the 5:55 mark, when somebody walks into the frame and tosses a large Trine poster into the garbage pails behind them. I would almost think it was a planned maneuver, except that absolutely nothing about the video suggests that any of it is being played for laughs. It's more like they're talking about how somebody shot their dog.